We had a mostly golden October with a Cinch Weed carpet covering the desert floor, and temperatures reaching back up into the nineties over the weekend. So both my art shows, one in Patagonia and one last weekend at Phillips Plaza in Tucson had excellent weather, great customers and artists huddling in a few shady spaces. But yesterday our temperatures in Arizona dropped! It's cold and wet, with snow flurries in the mountains and lightning storms. Breakfast on the patio at below 50 degrees, Jacket weather! We measured 2.71 inches of rain in our gauge for this month, the most for any October since we moved here in 2002. 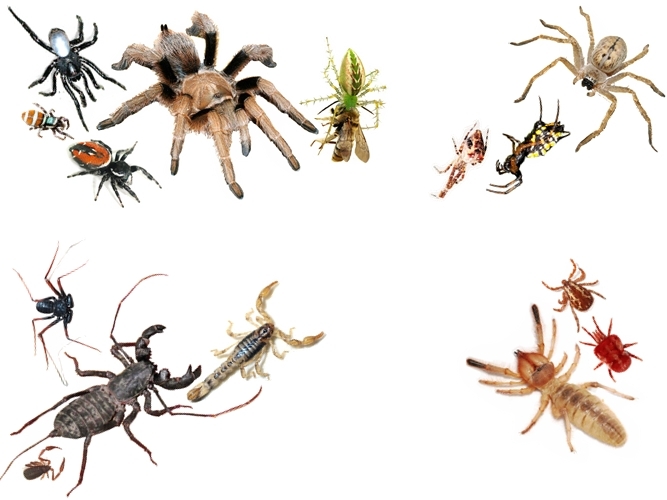 I am working on a new poster: Spiders and other Arachnids of Arizona. It won't be ready for Halloween, but it is not meant to become a short lived spooky decoration anyway. Rather it's supposed to show the beauty of spiders and maybe raise some interest in this fascinating group. So here is a teaser - 15 of about 50 images are placed so far, but they can still be moved around some. I will also again make a black and white template with the species names that I'll send out by e mail - to everyone who orders this poster. The size will be 18 by 24 inches to match the Arizona Beetle Poster. It will cost $20 plus shipping. You can order by e mail mbrummermann@comcast.net or message me on my Facebook page. I will add new images here as I progress. At least it could have been. Luckily Randy spotted a rattler this morning and called me to bring my camera. Looking more closely, we found that 'our' big Diamondback had crawled into a chicken wire cage and got stuck. The wire had been used to protect young plants, but we learned a while ago that it can be fatal to all kinds of reptiles who get stuck in it. So the fences were out of commission and should be stored out of reach, but a recent windstorm had blown stuff all over the place. So I got a long-handled pair of clippers - but it only served to bend the loop away from the snake's body. He still couldn't get out. So we had to get closer. He's a very strong, big snake. I remember his powerful writhing from the only time I had to move him - an unsettling experience even though I'm used to lifting snakes with hooks or tongs. This time we used our old noose-stick. Not a tool to lift a delicately boned snake, but quite safe for holding the head in place. So Randy held him and I got the wire cutters. It wasn't difficult, the snake held still and slid out of the wire fence unharmed. He immediately rearranged his coils and stared indignantly, but stayed in place for a while before slithering off. I'm sure we'll see more of him, he's been a regular visitor to our patio for months. We were lucky that we found him early in the morning of a cloudy, rather mild day. Direct sun exposure kills a snake in no time because they have to depend entirely on behavioral thermoregulation. Baccharis sarothroides. Common: desert broom. 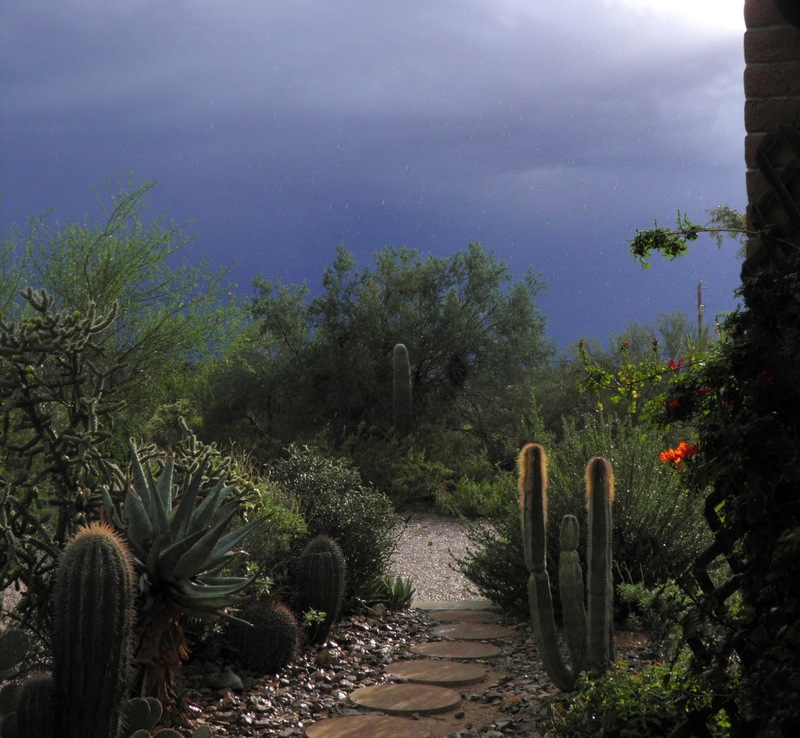 Family: Asteraceae is native to Sonoran, Chihuahuan and Mojave Deserts. It is a pioneer of disturbed grounds - so it often grows along road sides where the road runoff also provides it with some additional water. 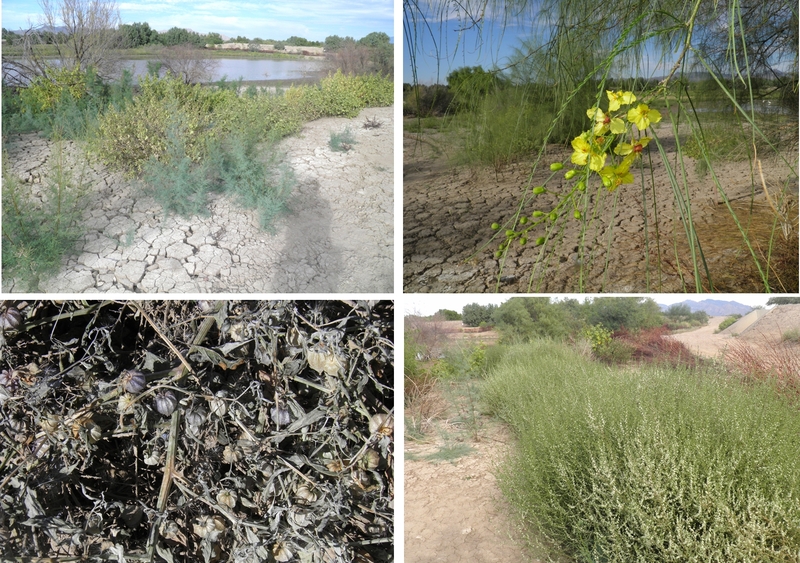 For insects, Desert Broom offers two high seasons per year: In July-August, after heavy monsoon rains, juices raise and seep from the brittle bark - the seeping usually initiated by chewing mouth parts of wasps and beetles or the sucking beaks of Giant Agave bugs. But in late October, when even here in Arizona most other flowering plants are entering their resting period, the Desert Broom finally blooms.It is a dioecious shrub, meaning the pistillate (female) flowers and the staminate (male) flowers are on separate plants. Female flowers are more elongate and will at maturity release an abundance of feathery fruit. Of course, the 'Hinterland' determines exactly which insects will actually take advantage of the brooms. We have a few in our backyard in the creosote flats west of the Tucson Mountains. 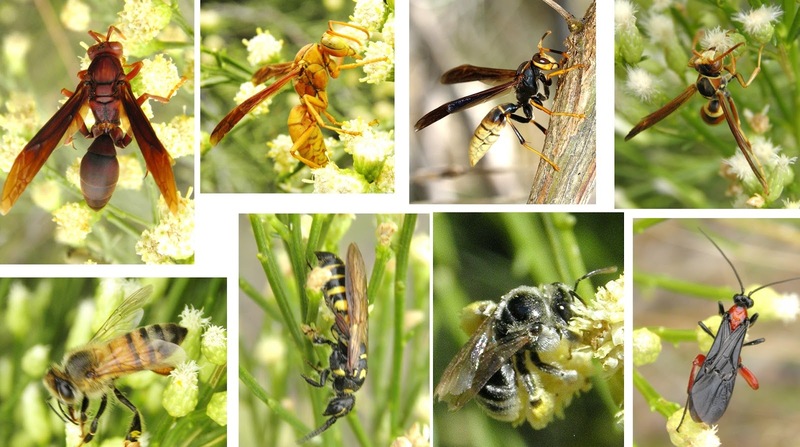 They attract their share of bees and wasps, but the number of species is limited by the surrounding habitat. So on October 14, I visited the Brooms in lower Madera Canyon, a much more divers area comprised of Grassland, Mesquite bosques, slopes with Silverleaf Oak and Alligator Juniper and the Sycamore and Hack berry rich riparian zone along Madera Creek. 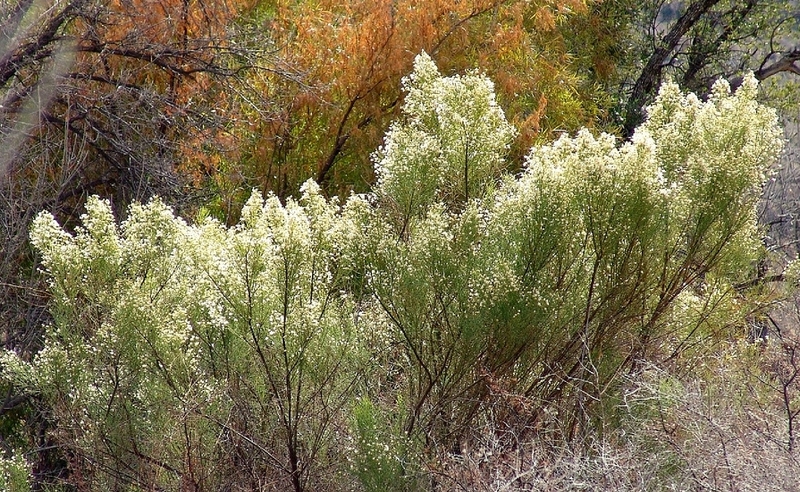 The brooms were just beginning to bloom, while Turpentine bushes were at the very end of their blooming season. The weather was blustery and cloudy, not ideal for macro photography. 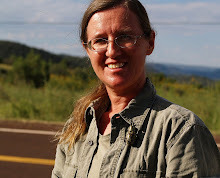 So I did not try for beauty shots but for recognizable documentary images and I set myself a time limit of 30 minutes. During this time, I visited a number of brooms around the pay station and between Proctor Rd parking and the road crossing with the creek. Not all images are identified yet, I will add ids as I get them. Most larger butterflies Like Queens and Ladies where absent due to the blustery cool weather. So the Lepidoptera yield was rather small. Tragidion densiventre, Sphaenothecus bivittatus, Lobometopon fusiforme (with Largus sp. ), Euphoria leucographa, Enoclerus hoegei, Hippomelas planicauda, Hippodamia convergens (Convergent Lady Beetle), Epicauta sp. 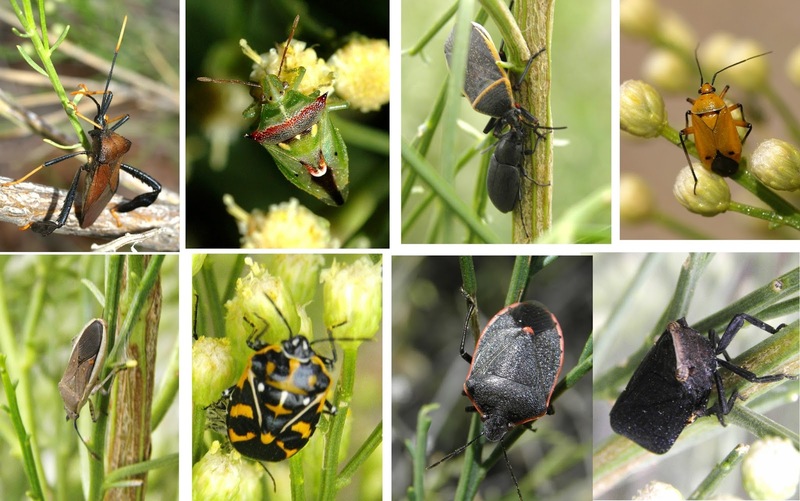 There were a few more beetle species, but noticeably few actual flower visitors. Instead, many of the beetles were still licking sap from the stems like they do in summer. The latest rains, unusual for October may be the reason that the sap flow is still strong. 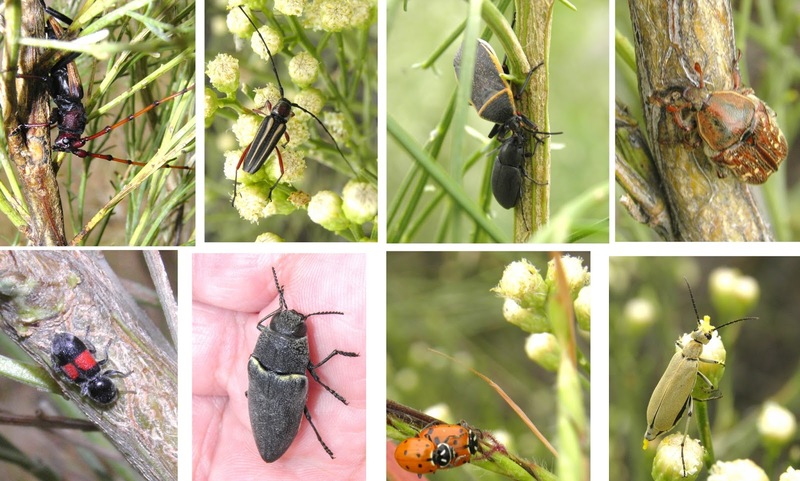 Typical flower visitors are the smaller longhorn and the blister beetle. The Buprestid was obviously on his way to nearby acacia where his species mates were waiting. Two Chauliognathus species were congregating and mating on the broom flowers. A third species stayed exclusively on Turpentine bushes only a few feet from the brooms. Many flies of several different families were feeding on nectar, sap, pollen or preyed on other insects. Hymenoptera were at first mostly represented by Honey bees. As it warmed up, at least four species of paper wasps showed up, representing probably all species that nest around Proctor Rd. The braconid is a brood parasite of the also present Sarcophagidae (Flesh Fly). This wasp still needs identification. Hemipterans were very well represented, I had never seen as many Harlequin Bugs together. So I photographed 34 species in 30 min, which included some walking time between sites, the weather was sub-optimal to say the least, and a number of photo shy critters never got their portrait taken. I addition, I shot a number of spiders that I will introduce in another context. I have had richer days at the same site, but also much poorer. So tonight I had the rare chance to watch the Antiques Roadshow because Randy, who thinks it's terribly boring, was still working on a paper. Suddenly there was some barking in the kitchen and a strange ongoing sound. Tascha the cat and three dogs were sticking there noses through the door of the pantry where they are usually not allowed. And still that strange sound. A rattle? A hiss? A snake for sure, and most likely a gopher. Randy got the dogs out of there, I got shoes (just in case), my camera, and my snake hook. But the pantry is not big and full of shelving - it was suddenly very difficult to determine where exactly the sound was coming from. When I finally got a hold of it, it turned out to be an about 4 feet long Gopher or Bull Snake. How did it get inside? Anyway, he's back outside to hunt pack rats now. We are glad to have him. As stated in the previous blog, the vegetation around the Coachline Gravel Pit is heavily disturbed. Large areas are covered exclusively in Cocklebur (Xanthium sp. ), others in Dock or Sorrel (Rumex sp.). Two species of Salt cedar (Tamarix top left) lost some ground during the flooding but are making a rejuvenated come-back. 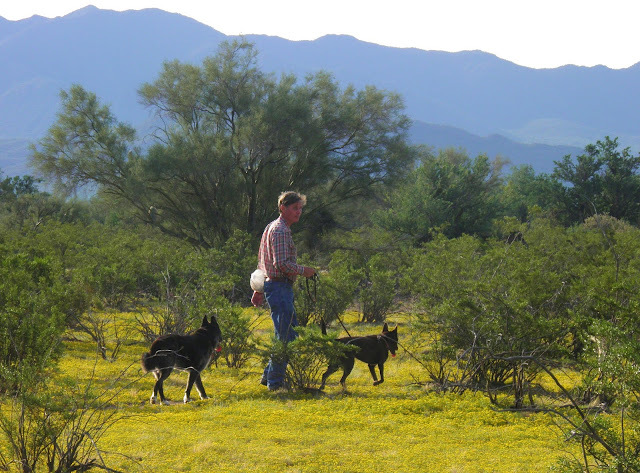 The only Native tree competing successfully is the Mexican Palo Verde (Parkinsonia aculeata top right). Much of the ground cover consists of imported grasses and at least 5 species of Night Shades (among them Ground Cherry, bottom left). Over the last year, Russian Thistle (Salsola bottom right), one of the tumble weeds, has been gaining ground. All this is not the best base for a very interesting insect fauna, plus a lot of subterranean eggs and larvae probably succumbed to the widespread flooding. Anyway, I keep checking, hoping for something interesting. I found a number of flies which, to me, are most difficult to identify. So I will add taxons later, whenever I (or experts) figure them out. So it wasn't a great photographic haul, but one never knows, and it's only minutes from home.. Earlier this year, the Santa Cruz River jumped its bed during a flood and started rushing into an old gravel pit in Marana (Pima County, Arizona). Bird watchers were delighted, Frisbee golfers who had their parcours there were not, but resigned themselves to a course and stations under yards of slightly smelly water. That water quality seemed a problem to me. High in nitrogen, it favors invasive plants over the local desert vegetation. The site attracted migrating water birds and birders, but was otherwise as disturbed as I've ever seen an area. Eventually the river was forced back into its bed with a dam of sand and seeping and evaporation lowered the water level considerably. But, different from previous years, the pond never dried up completely. When I visited yesterday, I first scared up a Cooper's Hawk from the ground. Above, a Harris Hawk drew clumsy circles. Killdeer screamed, and a flock of 'Peeps' swooped back and forth. On the water, there were some Northern Shovelers, a few Mallards, and two small ducks that I could not identify because they are all in their drab summer dos. Egrets were strutting, along the muddy bank, more coming in for early roosting spots. A single Yellow-headed Blackbird perched on some old tires. Only one Vermilion Flycatcher alternated between perching and swooping over the water - very much like some of the dragon flies. I saw Mexican Amberwings, a Darner, Black Saddlebags, Variegated Meadowhawks, Roseate Skimmers. 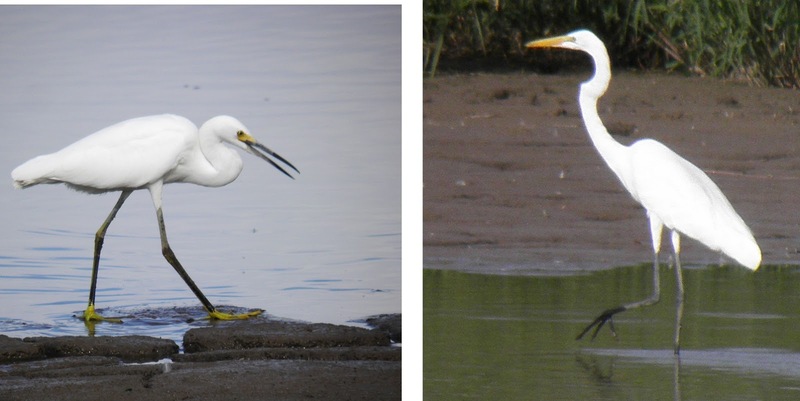 Flapping of heavy wings and a lot of splashing drew my attention back to the water: a single White American Pelican was cruising there, trying to fish in the muddy water that was quite obviously to flat for his big beak. Still, he must have gotten something because he kept going. After his meal, he thoroughly preened and I got a better look at his wing marker. I reported the number later to the Utah Division of Wildlife Resources. But it turned out I wasn't the first to do so. 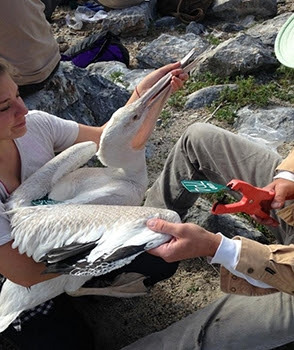 anyway, now I know that he was tagged near Gunnison Island in the Great Salt Lake on July 22 of this year. At that time, he was too young to fly. So that's his baby picture, sort off (Photo Utah Division of Wildlife Resources).